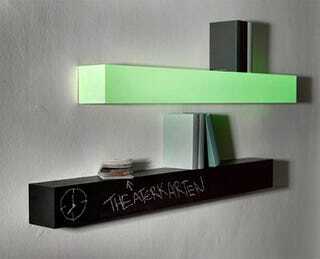 Billing itself as interactive furniture, this Daywriter/Nightwriter functions both as a shelf and a dry-erase board. It also seems like a great way to make passive aggressive notes towards your roommates look vaguely artistic. The Daywriter basically uses what looks like chalk to write messages during the day. Use this area to place your apartments bills along with a hastily scratched "I can't afford to pay all these myself, you know."